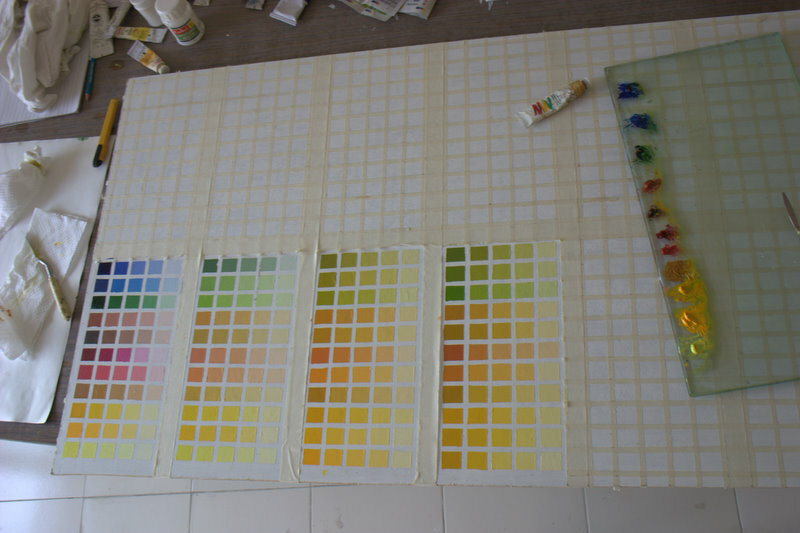 Currently I am doing color charts with the colors (Camlin) that I mostly use for painting in oils. Though this method of understanding and learning to mix is mentioned in many books / websites, I got to know the details of doing those from Richard Schmid‘s book “Alla Prima: Everything I know About Painting“. Below are few photos of my progress. This is the first stage. My colors laid out on my palette and the knife is ready to go. On the right is a board painted with 2 coats of acrylic texture white used instead of gesso. The lines you see on the board are of the masking tape making small squares/rectangles ready to be painted in. Measuring and making / taping the 12 sets of square/rectangles with each set containing 55 small rectangles took me and my wife about 4 hours. Doing it alone I do not know how much time it would have taken! Lemon Yellow, Chrome Yellow Deep, Gamboge, Yellow Ochre, Vermillion Hue, Alizarin Crimson, Burnt Sienna, Venetian Red, Sap Green, Cobalt Blue and Ultramarine Blue. 1. Top row across each chart is pigment as it comes from the tube. The vertical columns are those same pigments or mixtures with white added in increasing amounts, like a little value scale for each color. 2. Bottom row should be just off white, as light as possible while still being an identifiable color. 3. Middle row should be the value halfway between top and bottom rows and will vary depending on how dark or light the color is. 4. Second and fourth rows should be halfway between the rows above/below them. 5. First column (vertically) is each pigment straight from the tube and then lightened down to make 5 values. The first row is that color mixed with each palette color with the main color predominating, then lightened with white down to five values. Continue with a new chart for each of the palette colors. Actually making the chart also takes lot of time and is tiring sometimes, but nobody ever said it is easy. I’ll post a photo again once the complete chart is done. "Tree lined road – I" and "Tree lined road – II"